at Christmas and long after. We’d like to take this opportunity to thank all visitors and friends to our garden website. We truly appreciate very much your visits, kind comments, and your continuing support and encouragement through the years. God bless!! Merry Christmas to John and Jacqueline. May God bless you and your family! Thanks for your wishes and blessings, A.Belle. Best Compliments of the Season and A Very Blessed and Healthy New Year to you and yours too. God Bless. Hello Jacqueline. I’ve not been active both in blog and FB this holidays, as I am so tired cleaning overgrown weeds in the property in the province. My arms and legs are full of itch and scratches now, a dab of alcohol is a bit painful. But i enjoyed doing it and had lots of exercise. 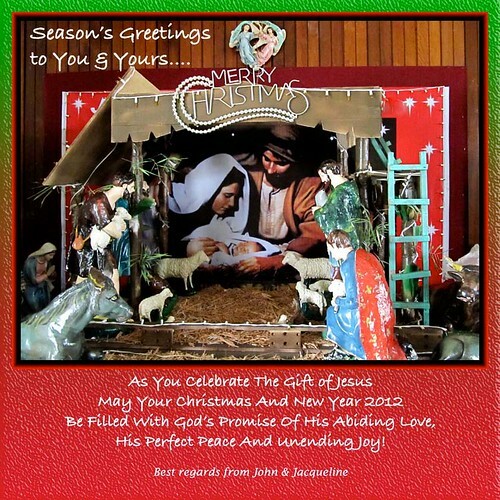 Thank you so much for your greetings in my site and I am sure you are fully blessed in 2012. A lot of us your readers will be thankful too for your lovely and informative posts. Take care and God bless.